Good Morning Everyone! It's Lynn today, and I'm sharing a card I made . When I saw Katie's Friday Challenge "beautiful birthdays", I knew I wanted to play along. 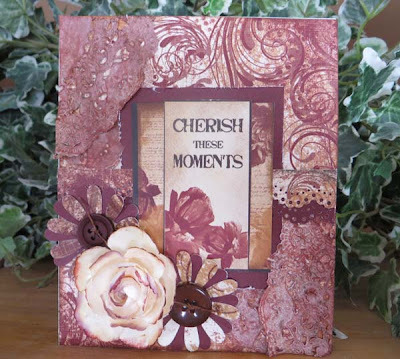 I have a friends birthday coming up and she loves vintage, so I knew that the Cracklin' Rose was the perfect collection to use for her card. For the card I used the patterned paper from the Cracklin Rose 6x6 Paper Stack. I love the tiny prints and the smaller quotes that come in this pad. I've almost used up the whole entire stack! I made the flowers using a punch and patterned paper, then chalked the edges with the Mocha Mama PowderPuff Chalking Ink . For the cream flower, I dusted the edges with the Bloody Mary PowderPuff Chalking Ink . I was on a roll with the punches so made two borders using the Paper Stack. I can't wait to see what everyone does for Katie's challenge. Hope your all having a wonderful day!! Oooohhhh so pretty!! I love how you colored the doily!! Beautiful!